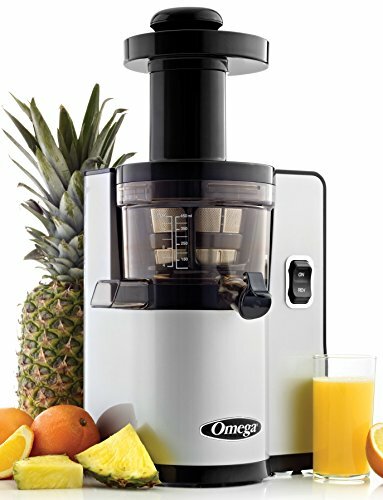 The Omega VSJ843Q Series is the slowest vertical masticating juicer out of Omega’s previous models. It’s the square-shaped version of the VSJ843 line-up. Here’s the round shaped models if you’re curious. There’s basically no difference between these machines except their body profiles. Omega VSJ843QS and Omega VSJ843QR operate at half the speed of standard slow juicers, rotating at only 43 RPM. It comes with a twin-winged auger that powers the Automatic Wiping System (AWS) that rotates as the machine is operating, clearing away any pulp buildup from the juicing screen with the silicone wiping blades. The auger shape and style is slightly different to accommodate for powering the AWS. The juicing screen is more compact and mainly composed of stainless steel. The mesh holes are smaller, which means you will have less pulp in your juice. This particular model comes in silver (VSJ843QS) and red (VSJ843QR) finish with black trim and weighs 22 pounds. It is not tall and fits nicely under most cabinets. The one-fifth HP condensed motor only uses 150 watts and 120 volts of power during operation. Ultem plastic makes up the auger and plastic portions of the juicing screen. This heavy-duty plastic is eight times stronger than other plastics. All plastic components touching the food are BPA-free. It takes up far less space than horizontal masticating juicers. It features a juice tap that allows you to mix your juice and nut milk inside the juice extractor before letting it flow out into your glass. Additionally, you can mix the juice inside to remove more pulp content from the liquid. Masticating juicers operate at lower noise levels than centrifugal juicers, but in test runs and customer reviews, this juice maker is even quieter than previous Omega masticating models. The only sound you hear is the soft whir of the motor and crunching of produce. Since it is so heavy and does not have a handle, place it somewhere permanent. It is much easier to assemble than previous models. In other models, everything needed to be lined up in order for it to work, but for this one, you simply set the components straight onto the juicing machine. The lid of this electric juicer does need to be lined up, but it clicks right into place. As with other upright masticating juicers, prepare dense and fibrous produce by cutting it into smaller portions. For example, Swiss chard or celery must be chopped into pieces smaller than an inch in length otherwise the fibers will wrap around the auger instead of pushing through the machine. Less dense items, such as cucumbers, can be placed whole in the feed chute as long as they fit. Softer items and leafy greens need a harder item to help push them through the juicer. Since this type of juice extractor is self-feeding, the only time you require the pusher is if something does not want to feed into the machine naturally or seems stuck. Of course, if the machine becomes jammed, simply reverse it to back up the contents. This will effectively unjam the machine. If you put too much in at a time or put in large, hard items without chopping them into smaller pieces, then you may clog the juicer. Allow it to feed itself at a steady pace to ensure steady operation. The AWS reduces cleaning time, making it a simple process. Before breaking down the parts, close the juice tap, and pour a glass of water into the juicer. Flip it on and allow it to run for a few minutes. It practically cleans itself by wiping away lots of leftover pulp. Allow the water to drain into the sink or another container. Take the juicer components and place them in hot, soapy water to scrub clean. It is OK to rinse everything off and set it aside if you need to clean it later. However, use the toothbrush-shaped stiff bristle brush to clean the juicing screen. Do not allow the pulp to dry in the mesh because it will be extremely difficult to remove later. Do not forget to clean out from under the auger because it will have pulp under it. The opposite end of the toothbrush can help you scoop it out, and then rinse it. Rinse thoroughly and let everything dry completely before you put it back together. The Omega VSJ843Q Series is a slow masticating juicer, operating only at 43 RPM to slowly separate juice from the produce you feed into the juicer. This method helps to maintain the integrity of the juice, therefore producing juice full of flavor, phytonutrients, and vitamins. The ejected pulp is extremely dry, meaning you are also extracting the highest yield possible. If you want as little pulp as possible, either allow the juice to collect in the bowl before letting it out or once you have finished, pour it back into the machine with the juice tap closed. Let the machine operate for a minute or two to remove more pulp with the silicone wiper blades. The mesh strainer is the perfect tool to catch the excess pulp and leaves you with silky smooth juice. Since the levels of oxidation are lower with this process, you are also able to store it for up to 72 hours in the refrigerator. You can create batches of juice to drink throughout the day. Pour the juice into single-size containers to take on the go. As long as you keep the juice cold, it will stay fresh. Use a tightly sealed lid with a glass container. It should be noted that fresh juice is best when consumed directly after being juiced. What Kinds of Produce Can Omega VSJ843Q Juice? All types of produce can be processed by this juice press—soft & hard produce, leafy greens, citrus fruits, and nuts and beans. Hard produce includes bitter gourd, fennel, cauliflower, sweet potato, cilantro, pepper, ginger, watermelon, beets, pineapple, celery, garlic, asparagus, broccoli, apple, turmeric, yakon, pumpkin, pear, cucumber, carrots, and coconut. You can turn soft fruits such as tomato, cranberries, blackberry, peach, mango, kiwifruit, grapes, melon, avocado, pomegranate, strawberry and papaya into a puree using this machine. Leafy greens include dandelion greens, peppermint, wheatgrass, pine tree needles, cabbage, spinach, parsley, spring onion, basil, lettuce, moringa, beet greens, kale, collard greens, and brussels sprout. Citrus fruits include grapefruit, lemon, tangerine, mandarin, orange, and lime. It can also help you make soy and almond milk to add variety to your juicing routine. Omega VSJ843QS and Omega VSJ843QSR rotates at half the speed as previous models and introduces a dual-edged auger with a tighter fit tolerance, allowing it to gently squeeze the juice out while keeping the nutrients and enzymes intact. Subsequently, this also delays oxidation and increases storage time. The new auger has been designed to work in conjunction and to power the Automatic Wiping System, eliminating the need for an additional gear unit at the bottom. Even though some may find the pulp collection under the auger to be a nuisance, it only takes a minute to rinse the pulp out. Create sorbets, green juice, vegetable juice, fruit juice, nut milk—and any other creative concoctions you come up with or find on the internet. The juicer tap allows you to mix numerous ingredients without worrying about making a mess. Plus, the juice tap makes cleanup quick! The price of this machine may seem like a lot, but when you visit a juice bar, you’re going to pay at least $8 each time for a fresh glass of juice. If you frequent the juice bar a few times a week, it really starts to add up. If you juice every day or even every other day, this cold press juicer pays for itself within a couple of months. Additionally, it is completely covered by a 15-year warranty, meaning if the juicing screen breaks—you’re completely covered. The Omega VSJ843Q Series is an excellent heavy-duty juicer for the person who is serious about investing in their health.